Advertised as “Amazing iPad Animations”, the video below uses a technique as old as animation itself, and really, it’s not that amazing. Â Well, turning your $500.00 iPad into a $10.00 pre-schooler’s board book is pretty amazing I guess. Â So here’s the amazing video. Â With the publication of his 2007 children’s book,Â Rufus Butler Seder calledÂ this display technique Scannimation. Â In gathering information about his books, Seder states that he has invented this technique for books and has obtained a patent for it. Â See the video for his explanation of his invention. Interestingly, theÂ ScanimateÂ program was being used for motion capture experiments, animated intros, and animated logos back in the 1960’s. Â There’s a pretty interesting news report videoÂ here. Â But this whole process and technology goes back even further than that. 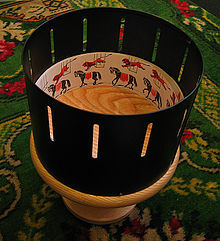 The Zoetrope was created in China around 180 AD and then refined in 1834 by British Mathematician William George Horner. The Zeotrope is made from a cylinder with slits cut vertically in the sides. Beneath the slits on the inner surface of the cylinder is a band which has either individual frames from a video/film or images from a set of sequenced drawings or photographs. As the cylinder spins the user looks through the slits at the pictures on the opposite side of the cylinder’s interior. The scanning of the slits keeps the pictures from simply blurring together so that the user sees a rapid succession of images producing the illusion of motion, the equivalent of a motion picture. Cylindrical zoetropes have the property of causing the images to appear thinner than their actual sizes when viewed in motion through the slits. This AMAZING moving picture parlor trick led to the creation of flip books, and then motion photography, and then film, and then animated motion pictures, and then super technical 3D computer rendered imagery! Â Then the technology advanced and compacted and now we can walk around with the equivalent of a whole BUILDING’S worth of 1960’s computing power in the palm of our hands! Â What better use of this magnificent marvel of technology than to turn it into a toy from the 1800s. DOH! Yeah, I got the spelling correct in the body of the post, just not in the title. Nice jorb doofus! Previous story Spencer Brinkerhoff III recorded "Working from Home"